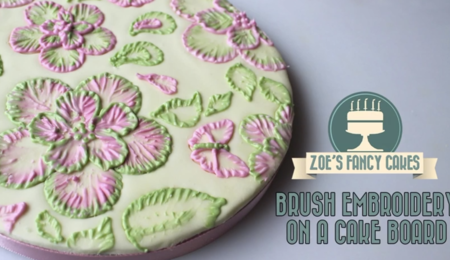 Commonly referred to as the 'Viva Paper Towel Method,' this tutorial shows you the step-by-step process of how to achieve perfectly smooth buttercream every single time. Continue all the way around the cake. With a large metal angled spatula dipped in VERY hot water. Remove spatula from water, dry the spatula and go around the cake…in sections till is all done. 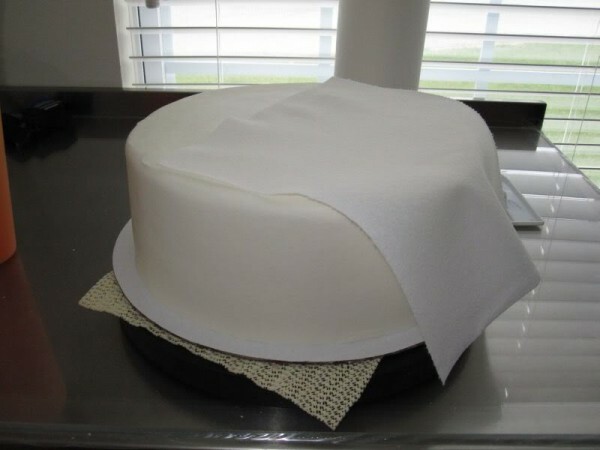 With the smooth side of a viva towel rub the cake all the way around pushing any air bubbles up. With the smooth side of the viva towel round the edges with your fingers. 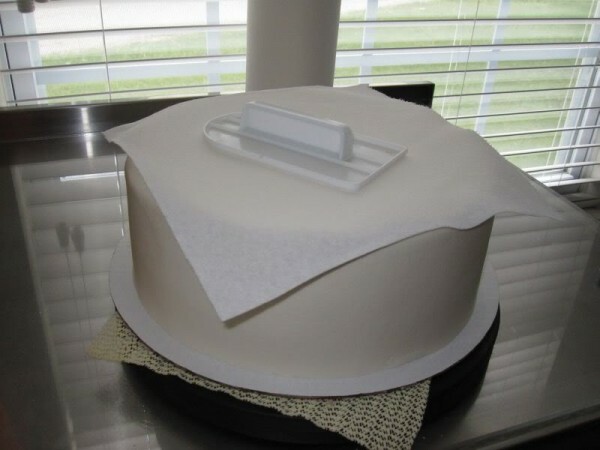 With the viva towel and a fondant paddle smooth the side of the cake. With the tip 18 fill the top of the cake. With a VERY hot angle spatula smooth the top of the cake. Continue the until top all done with the hot spatula. With the smooth side of the viva towel and your hand smooth the top and the edge blending the edge well. With the smooth side of the viva towel and the fondant paddle smooth the top and the sides one final time. Thank you for sharing. Will definately be trying that out on this weeks cakes. Do I have to wait till butter cream crusts ? I've tried this method before and I have same issue as Sandyvrc, paper towel stuck to the butter cream :( , or could it be the buttercream recipe I am using ? Yours is so smooth , I had made rosets and dots and stars just to cover my mess I would love to be able to get smooth like yours :) looks perfect . I love the finish product. Your icing looks so white even that you used butter. It looks like if it all shortening. Did you add white color? It looks so pretty! thanks for sharing this! i would also be interested in knowing your BC recipe. Thanks for sharing, I will definately try this. 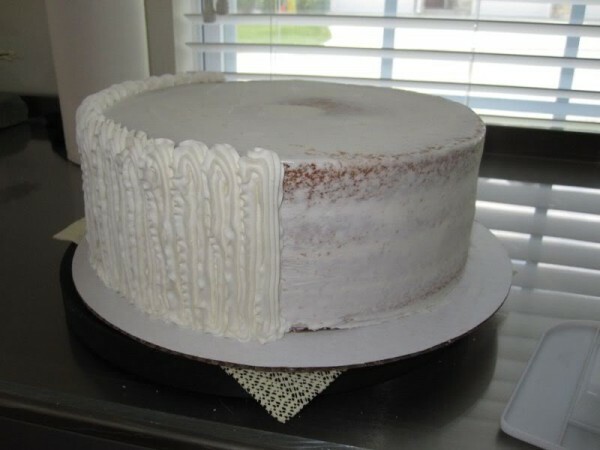 My cakes bulge slightly between the layers. Any ideas what I can do to prevent this? I would also like to see the square version, and your buttercream recipe, thanks! Thanks for sharing. What buttercream recipe do you use? I would also love to see the square. I will try to do it. Thanks again!!!! Thanks for sharing!!! After you have piped with the 18 do you smooth with spatula up and down or around in a circle? Thanks for this. I would love to know what buttercream recipe you use. 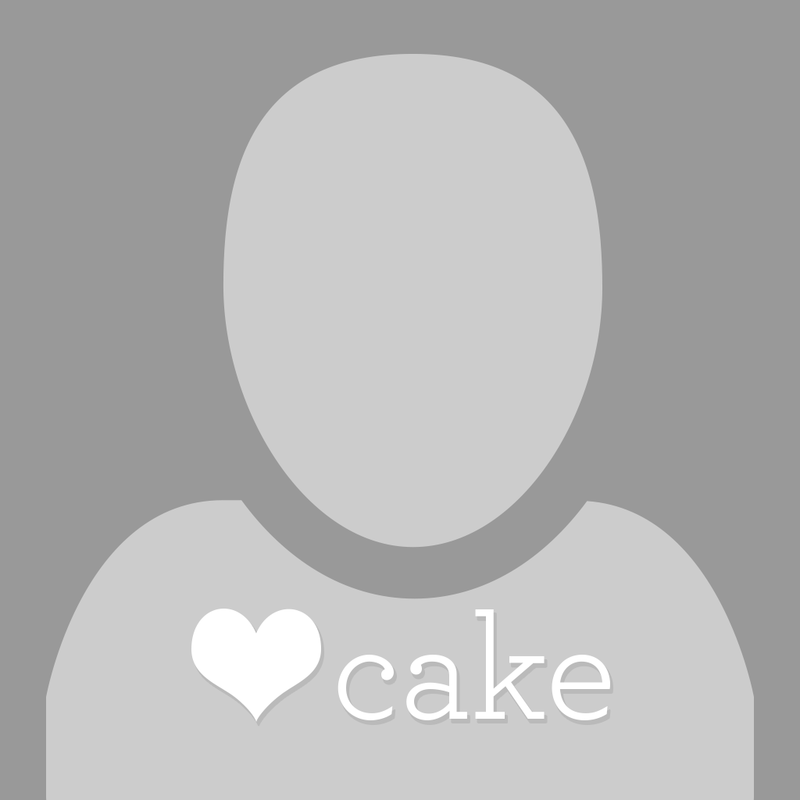 can you please share your buttercream recipe? Amazing. I can never get mine to look like this. I also would love to know which BC recipe you use. Looks beautiful! Thanks for sharing!! I also would like to know what buttercream icing you use to make this technique work? I use the Wilton buttercream icing and although I have never tried this method, I'm pretty sure that icing would stick to the paper towel. Thanks!! I totally wish I logged in yesterday before I iced my cake. First off, corners are rough to do! Anyone have a tutorial on that? I started with icing the top first then the sides. I ended up going back and forth several times but the end result was amazing! Love the viva method! The buttercream recipe I use is the buttercream dream located on here. Thanks for sharing this! I feel much more confident using buttercream again! I add a tablespoon of meringue powder to Wilton's buttercream recipe with shortening to get a really white buttercream that crusts after about 15-20 minutes. I have never had the buttercream stick to the paper towel using this recipe. You can probably do that same with buttercream that uses butter but I've never tried it. Some of the comments in the recipe below mention the paper towel and crusting techniques...haven't tried it but it seems they have. Looks like it would work well. 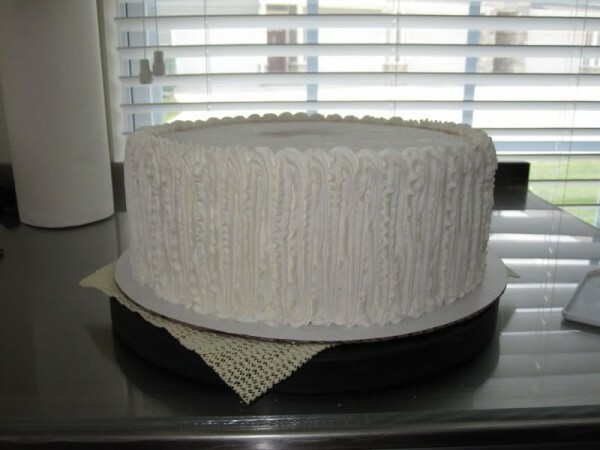 "Fluffy Crusting Buttercream posted 24 Feb 2012 Posted by cbrosado in Frostings"
Is there any way to do this using a buttercream that contains butter and NO shortening?? to all, you must make sure the buttercream crusts, put it in the frige or let it sit for half hour or longer. It will definitely work! Thank you! I have had trouble with this! My cakes will look SO much better now! Same here. Big help. Not as perfect as your yet, but a big improvement. 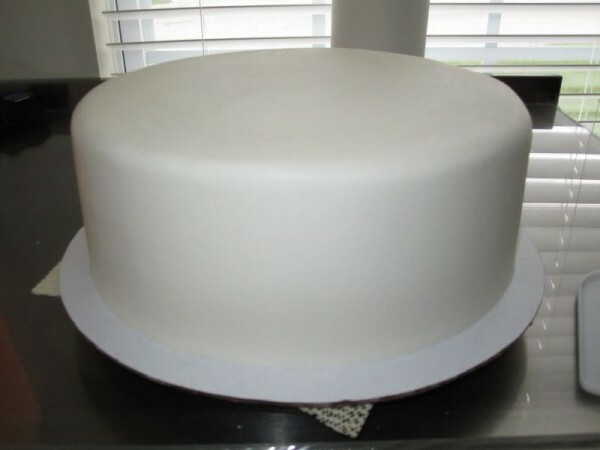 Any pointers on getting neat corners on square or rectangular cakes?? What a GREAT & HRLPFUL tutorial. Thank u so much for doing this! I just tried this and it was a huge improvement. Thank you so much for posting this. We don't have Viva paper towels in Australia. What can I use? Anyone in the Toronto area know where to get Viva paper towels? Thanks for the tutorial tutugirl. Wow, perfection! It looks like Fondant! Which BC recipe fo you use? I don't like the one I use anymore. Wow! Your icing method and smoothing technique is AWESOME! This looks like a cake covered in fondant! Thanks for sharing your great tip!!! Thanks for posting this. I use the Viva and it does work very well with a crusting buttercream. I will definitely try the hot spatula tho this weekend. Thanks for sharing! I usually make a chocolate whipped cream filling with my cakes...don't know if almond flavoring would be good with it. Does anyone have a great filling that you would use with this icing? I'm doing a baby shower cake. Thanks! I've been searching tutorials on how to smooth the bc and I have to say this is the easiest looking method I've seen so far. I can't wait to try it. I only offer Fondant covered cakes to my customers, being that I'm a perfectionist I don't like the way my bc terminations look like, I have practiced over and over and I've gotten better, but never smooth like yours. I will definitively try your technique. Thank you so much for taking time to do this and help other bakes/decorators. Happy Baking and please share the recipe. 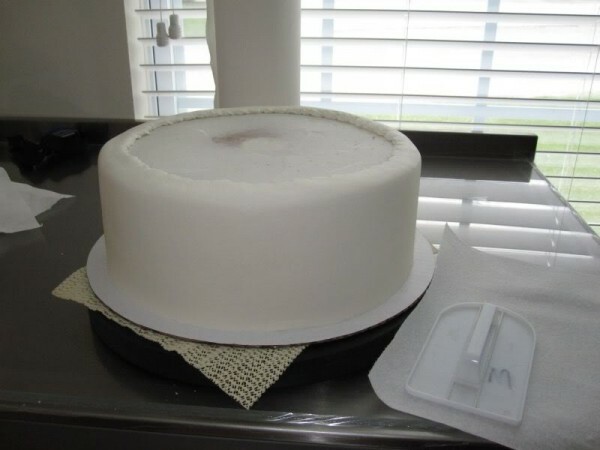 If you use an icing that won't work with this method, I have a video posted on another website that shows you another method. We are almost ready to post another on square cakes. Using an all bitter icing does not work well with a paper towel. Hello everyone!!! am new here but let me tell u that the best bc recipe is high ratio shorttening dont use butter, it will be white and smooth. I can't tell you what a boost this tutorial just gave me; I've been using this method myself for about a year and a half now - I thought I invented it and was getting away with some kind of a cheat! I also use the Wilton Buttercream recipe, and I let it crust for about 30 mins. I have also used the pick-a-size Brawny towels with success, as well as Viva. Plus, the pick-a-size towels are great for dampening and clean-trimming my base board with a pointy spreader just before I apply the base trim (those towels are so versatile!). Last year I did a deep red buttercream that just seemed so plain as I was finishing it up...I turned a quilted paper towel around and pressed it onto the buttercream surface with my smoother tool (as seen in tutugirl's tutorial), and the quilted pattern was exactly what it needed...super cheap texture at 89¢ a roll! Thank you for sharing, I live in Canada and I don't think we can get Viva paper towel here. I live in Australia and shortening is not something I can find. Any ideas??? For those who can't get Viva paper towels, go to an automotive store and get the blue shop paper towels rolls. They have no quilting and are just as smooth as Viva. They are a little stiffer though, but works as a good substitute. I hope you post your answers soon because I pretty much have all the same questions. lol In your tutorial it doesn't mention having the cake sit for any time after you pipe the icing on. Did you? I'm from India where can i buy VIVA® Brand Paper Towels. Thanks for sharing this I used it this weekend worked like a charm but how do you keep fabric hairs off it seems like the viva paper towel left a few arrgghh! and although they probaly are not noticeable i eagle eye my cakes and notice everything! Awesome! So need to try this!! That cake looks like it is covered in fondant! 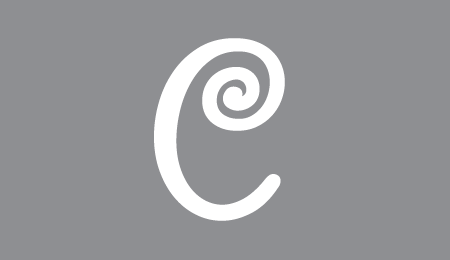 I would love to have the BC recipe you use , if you don't mind sharing it. 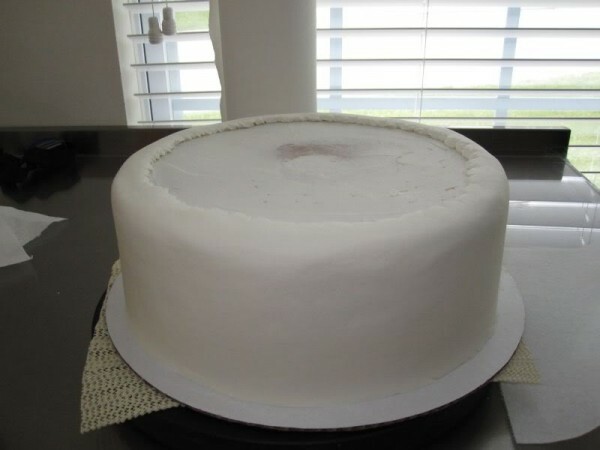 I have a two tier BC frosted cake to make for this weekend and would love to try out your technique. Thanks. How well does this method work with a sheet cake? Thank you for posting this! I tried this last night and it worked great! I also saved a lot of buttercream :) I just need to pratice more on the edges, but in due time I will master it. Thanks again! Hi can i use this tecnique for sheet cakes. From what I'ver learned to get a real white-white B/C you have to use CLEAR van., and your powdered sugar must be Domino. I also use merigue which helps it crust. I do not like fondant at all, so the paper towel technique (Viva) because it has no texture, really works well for me. You can do this with an all butter recipe, i do it all the time on all my cakes! And you can use other towels as long as your icing has crusted. To the person who asked about the little threads getting into the icing: i find shaking the towel vigorously for a few seconds before using helps, and i find its alot of the times the 1st few towels on the roll that have them :) Hope this helps. I use this method all the time and it works that great. The only trick is that you do have to use a crusting buttercream (like the Wilton bc). 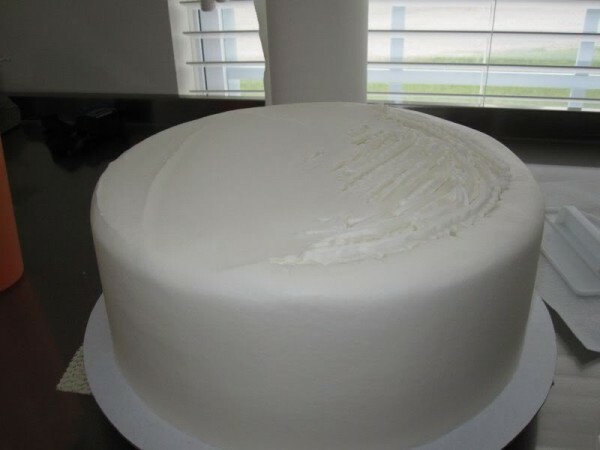 I frost the top at the same time, then smooth the whole cake at once. After you get it as smooth as you can with your tools, just let it sit on the counter for 15 minutes and crust over (do not refrigerate it until you are finished or it will not work). Once it has crusted it shouldn't stick to the paper towel. Start smoothing and working with it. After a bit, you may need to let it sit again and smooth some more. But it should work for you. I would love to see a you tube video!!! can you post one? thanks 4 sharing...... great job ! ! ! If you hadn't shown the pictures I would have sworn this was a fondant covered cake. 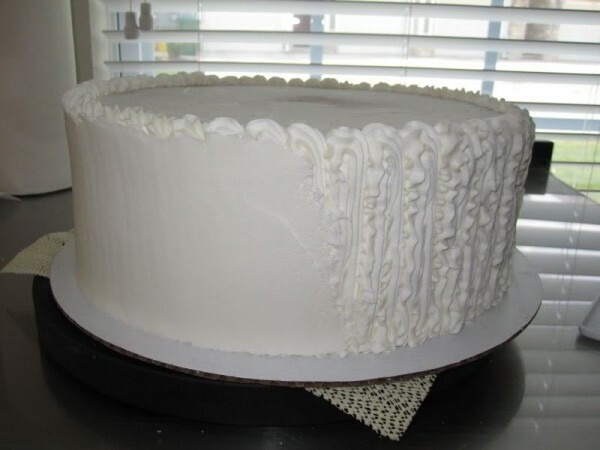 You iced that cake amazingly, thanks for posting and for sharing your icing recipe. 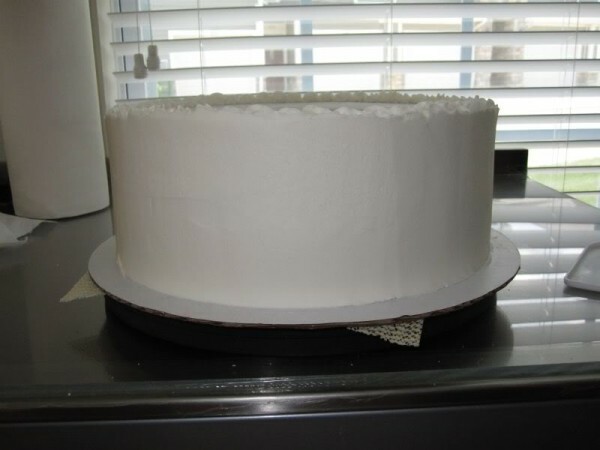 I teach Wilton classes and this is the method I teach to smooth the cake except I, alos apply all my icing and smooth with my spatula, let it crust, then come back and smooth with the Viva and my hand. Will try using the fondant smoother next time. I also use the Wilton buttercream and have had no problem with it sticking Recipe: 1 c white solid vegetable shortening (Crisco) 1 tsp clear butter flavor (Wilton) 1/3 c water 1 tblsp meringue powder 1 lb powder confectioners suger 1 pinch of salt This recipe makes approximately 2 1/2 cups, enough to ice a 8in layer If the icing consistency is not thin enough, you can add 1 tsp of water at a time until you reach desired consistency. This recipe works for me everytime. I also use it under fondant. This really reallt works. I was able to try it yesterday and i am PROUD. VERY PROUD. I wonder if we can use a tip lil bigger than an 18???? ggsbabycakes recipe sounds like it would work fine. Looks like the recipe from when I took a wilton course. Since the elimination of transfats from Crisco some people had difficulty with some piping staying where it was supposed to be on the cake. I have used a decorator's buttercream recipe which is quite close to the recipe ggsbabycakes gave with the addition of flour and cornstarch. The proportions were 1 tablespoon each of flour, corn starch, and meringue powder for 2 lbs of powdered sugar. Makes a wonderful "skin" to smooth and work about ten or so minutes. I use it on my wedding cakes, birthday cakes, just about everything. vonda627 asked if there was a bigger tip to use than an 18. I don't have an 18 but use a very large tip with no number that goes in a large bage with no coupler. It is 2 inches in diameter at the back and the tip is 1 and 3/4 inches by 3/8 inch. One side is smooth and ond side has teeth. It can lay on a lot of frosting in a short time. I got it where they sell cake decorating supplies. Fabulous! worked like a charm using the butterctream suggested and this method gave me great results, even in high humidity! 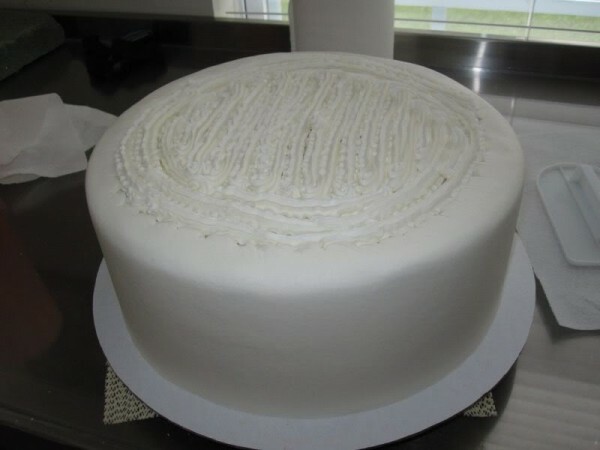 Pls can I do this and then place my fondant over it? 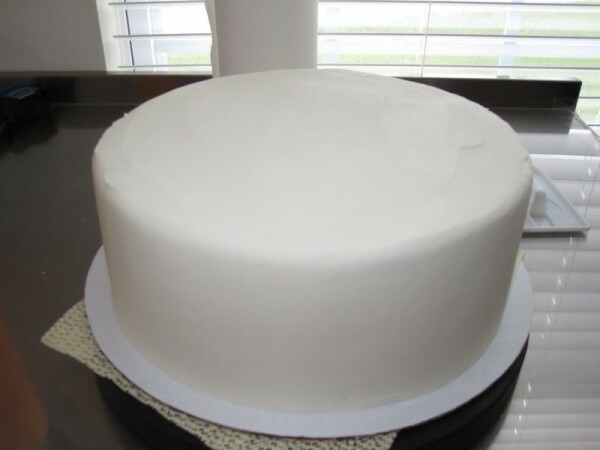 Thank you, do you let the cake chill a little for each smoothing step or did you coat and smooth all at once? Wow thank you for this I love a perfect smooth cake and had to work hard for it this look's easy! Can this recipe be double and what size cake this would cover? I live in the UK, anyone know of a brand of towel that will work here, as we don't get viva? I can't wait to try this! Thanks so much for sharing! You can purchase Viva Papertowels online at Amazon.com for those of you that live out of the US. The labeling and ingredients lists on products, including Crisco, can be a bit difficult to understand because, unfortunately, any product that has "hydrogenated" or "partially hydrogenated" fats and/or oils...of any kind...even if it is a "powder"...does have "trans fats" in it. The FDA has allowed products containing less than 0.5%...PER SERVING...trans fats to be labeled as containing "0% Trans Fats" since 2006. To understand this fully, you'd need some understanding of what 'saturated fats' are, what they are 'saturated' with (hydrogen, obviously...hence the name...LOL), and whether it is a naturally occurring full or partial condition or an artificially induced condition such as hydrogenation, or "full" hydrogenation, even some lard products are now hydrogenated, and/or partial hydrogenation as in many bottled (non-virgin and/or non-cold or expeller pressed) oils. I have always used a piece of waxed paper to achieve the same finish. Maybe that would be easier for you to buy. or you can use waxed paper and get the same effect. Smooth buttercream. Thank you this is great! I have a cake business and my customers do not care for crisco buttercream recipe. So i use the traditional buttercream recipe which requires butter and milk. Is it possible to use this method on my traditional buttercream recipe and get the same effect? For those of you who don't want to use shortening but want bright white icing, here's a good colour trick: add a little bit of purple food colouring. Yes, you read that correctly. Purple is the complementary colour of yellow, and it will pull the yellow tint out of the butter and make it white. Trust me, it works! The Purple does the same thing for taking the brassiness out of Bleached/Highlighted hair, will definitely work in the frosting. Awesome! Another thing I learned today. Thanks for sharing.